We work from 1 acre to 100 acres in both softwood and hardwood plantations, we specialise in the following operations. First, second and third thinnings. 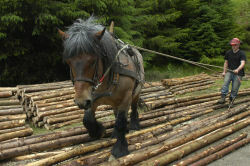 The horse causes less soil damage and less damage to the remaining timber stand. Sites of special scientific intrest. Working near rivers and lakes. Working near urban areas, public footpaths and parks.